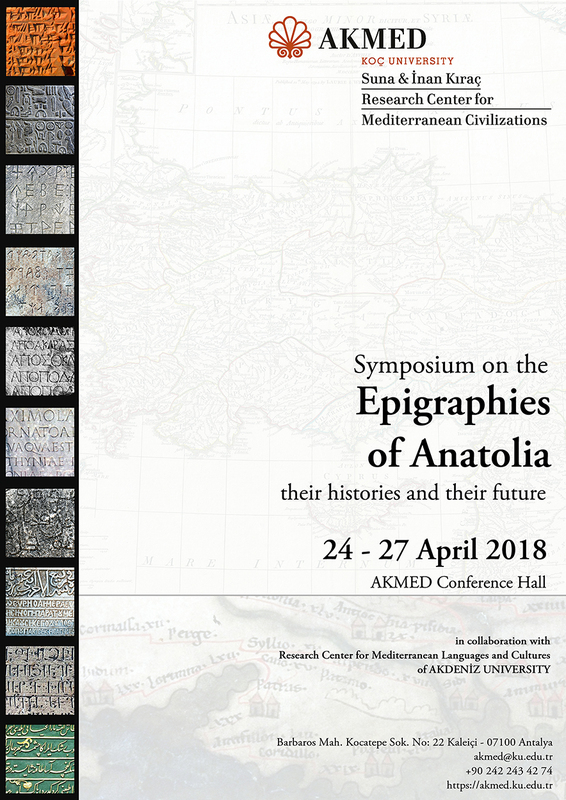 The Symposium on the “Epigraphies of Anatolia: their histories and their future” will be held from the 24 to the 27 April, 2018 in the Koç University Suna & İnan Kıraç Research Center for Mediterranean Civilizations in Antalya, Turkey. All are welcome to attend; the event is free, but for planning purposes please register on this EventBrite link. For more material visit the symposium page of Research Center for Mediterranean Languages and Cultures of Akdeniz University. The aim of the symposium is to allow experts, who work on the inscribed texts of different cultures, to present their work and compare their experiences, building a sense of the history of the epigraphic discipline. During the symposium we intend to look at how earlier generations have interacted with such texts by tracing the steady development of methodologies. We will examine how inscribed texts have introduced us to languages which had been unread for several millennia. Finally, we will look at how we can teach the necessary skills and find ways to offer the fullest possible access, both in and beyond Turkey, to this unique storehouse of knowledge. 15.20-16.00: Hakan T. KARATEKE – What is an Ottoman inscription?